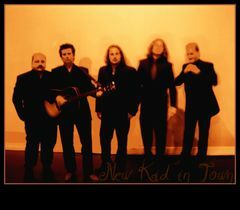 NEW KID IN TOWN is a live musical tribute to The Eagles. This 5-piece group combines raw talent, natural showmanship, and a love of all music to generate an infectious energy every time they take to the stage. When you encompass the timeless hit songs of The Eagles (including solo top 10’s from Glenn Frey, Joe Walsh, and Don Henley) with the signature guitar sounds and sweet harmonies of these accomplished musicians, you end up with Canada’s best tribute to the American super group. Attention to detail, five talented performers, plus the best songs ever written equal a thrilling musical experience. As soon as the lights come up these veteran musicians begin to form an instant rapport with any audience as they skillfully reproduce monster hits for Eagles fans of all ages!